It’s been a long and challenging year in the life of this project. We have been transforming 20 or so standing woodland oak trees, about 100 years old to a standing oak framed barn which hopefully will last for many more years than that. 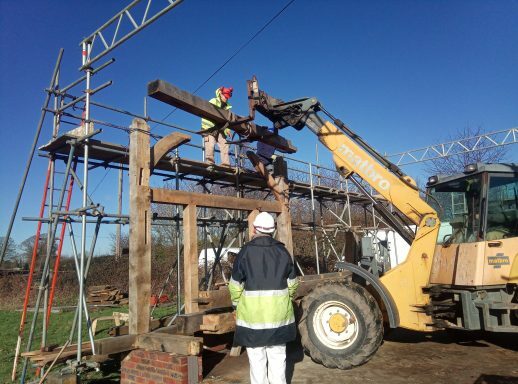 My colleague, Dan and myself made a start on milling the timbers two winters ago. Using his motto of ‘just keep chipping away at it’,eventually, after a freezing beast from the east and a long hot summer we managed to erect the skeleton of a frame towards the end of January. To recap: I am thinning a crowded almost full canopy of oak from two of the coppiced woodlands I manage about 10 miles from the site of the new ‘Old’ Barn in the High Weald Area of Outstanding National Beauty. (See Building a new ‘Old Barn’ part I). 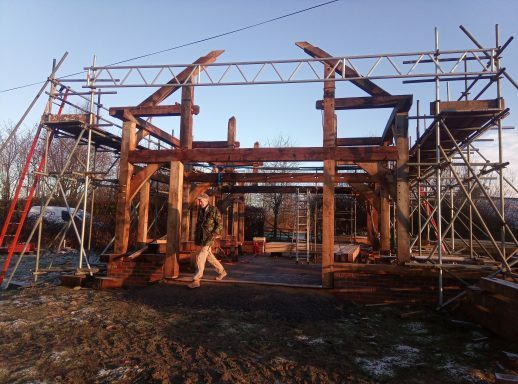 I have had two expert framers with me Richard Thomlinson of Thomlinsons Oakframed Buildings and Becca Tan, both have been instrumental in getting the building to this stage. They have also had to endure freezing temperatures, blowing gales and one of the hottest summers on record. 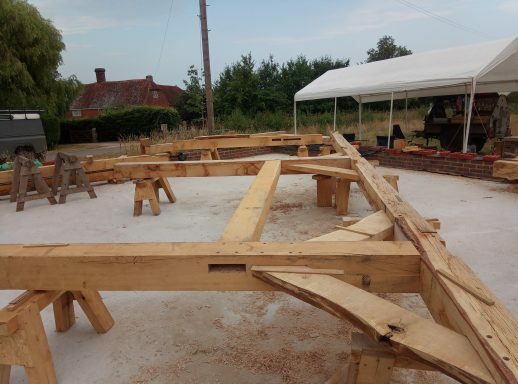 Unlike modern carpentry, using much smaller and usually seasoned timber, the beams and posts used in this kind of frame are rarely straight and rarely square, in fact they usually bend or twist when they come off the mill, it takes skill and experience to match them together and get them to fit! The problem has been especially difficult because of the hot weather, eventually we resorted to a ‘just in time’ delivery. Leaving the timbers in the relative cool of the woodland and trundling them down to the site as the framers needed them. Construction comprises of ‘lay outs’. Each wall is layed out on trestles’, carefully measured, marked, scribed and then cut with great accuracy. They are fitted together and when all is in place and looking good … it’s dismantled. 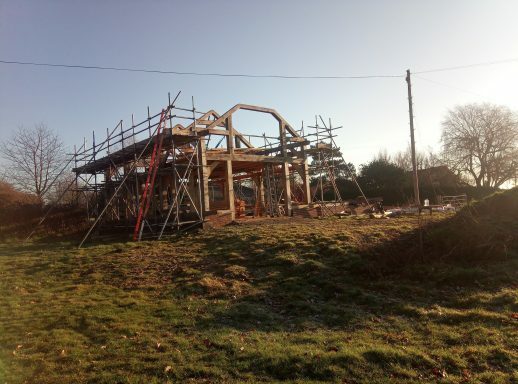 The cross frames which run in the perpendicular plane and the roof trusses are all given the same exacting treatment until eventually all the components have been tried together in each plane and we end up with a 3 dimensional jigsaw puzzle. Fortunately each valuable piece is marked with its unique position in the puzzle and it is finally all slotted together with the help of a fork lift truck. Okay so a traditional build but with concessions to modern tools. This is the part which for me has been a revelation. 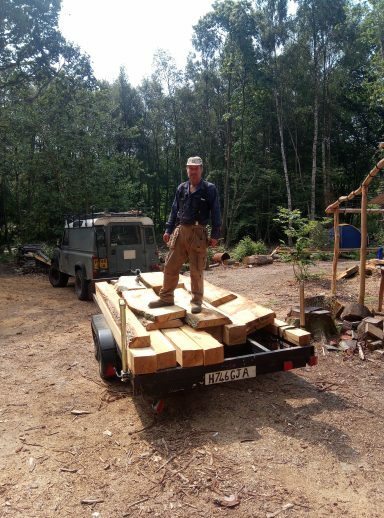 Realising the effort that we have gone through to harvest mill, transport and joint all the timbers for this build has been a challenge to say the least, but we have had the use of chainsaws, a sawmill, a 4 wheel drive and all sorts of power tools. You can only wonder at the effort of doing all this without such aids and it has filled me with awe and respect for the craftsmen that went before us and who were responsible for so many timber framed buildings which still survive today. One of the motivations for the project has been to create a building with as low a carbon footprint as possible. Already we have locked up a few tons of oak into the structure which may last half a millennium. It may not save the planet, but it is satisfying. Also satisfying is the fact that the considerable amount of firewood from the trees is going straight to local customers, the carbon given off from their combustion will be recycled naturally by the rejuvenated coppice re-growth and the sapling oak trees planted in place of those felled. The demise of some oak trees has given new life and vibrancy to the rest of the woodland and provided the materials for a truly sustainable build. Look out for Part III as we source some PAWS (Plantation on Ancient Woodland Sites) softwood for the roof timbers and cladding. Also a hugely satisfactory deal is done for 5000 hand made clay tiles from a clay pit less than 2 miles away.